If you’re looking for fun and effective exercises and activities that improve hand eye coordination, you’ve come to the right place. We’ve shared 16 of our favorites below, but first, let’s take a closer look at hand eye coordination: what is it, why is it important, and how can you help a child develop these skills at home, in therapy, or in the classroom? What is hand eye coordination and why is it important? If I had to define hand eye coordination in simple terms, I would describe it as the process by which our visual system coordinates the information received through our eyes and sends messages to our hands to fulfill certain tasks. Hand eye coordination is required for us to complete and participate in all kinds of activities, including reading, writing, typing, grasping objects, playing sports, and playing video games. Even tying our shoes, unlocking our front door, sewing, and driving require our hands and eyes to work together! When does hand eye coordination develop? Hand eye coordination starts developing in infancy. Even before a baby’s eyesight has fully developed, you will notice her beginning to grasp objects, and as her eyesight improves, she will begin reaching for objects and her hand eye coordination will continue to strengthen over time. How can I tell if my child has poor hand eye coordination? Generally speaking, a child with poor hand eye coordination isn’t reaching age-specific milestones, like reaching for objects, passing them from one hand to the other, throwing a ball, putting puzzles together, and getting dressed on her own. Your child’s pediatrician will ask specific questions at each of her check-ups, and will refer you to a specialist if there are indications of a delay. Having said that, always be sure to seek help if you notice your child struggling to do something you feel she should be able to do at her age, or you suspect a regression in your child’s development. PLEASE remember that all children develop at their own rate, and just because they aren’t meeting milestones at a specific age, it doesn’t necessarily mean there’s any reason for concern. If you do suspect your child is struggling and want to find ways to practice her hand eye coordination, there are HEAPS of fun exercises and activities you can engage her in. These feel more like practice than play, providing the perfect opportunity for your child to develop important life skills without her even knowing it! Ball rolls. This hand eye coordination activity is more suited for younger kids, and simply involves sitting on your bottom with your legs apart and out in front of you while facing one another, and then rolling a ball back and forth to one another. As your child gets the hang of this movement, challenge her to stop the ball with her hands before it reaches her body. Balloon tennis. Grab a couple of kids racquets, blow up a few balloons, and play a game of balloon tennis. You can hit the balloons back and forth to one another, and have a family challenge to see who can bounce a balloon on their racquet the longest! Bowling. Bowling is another super fun hand eye coordination exercise, and you can easily make your own set using empty water bottles and a soft ball. You can make this easy at first by using a bigger ball, and move to a smaller ball as your child gets the hang of the movements required to knock all of the ‘pins’ down. Too lazy to make your own set? Buy your own kids bowling set here! Play ‘over/under’. This requires a group of children of similar height, and can be pretty fun. Line all of the kids up facing forward, hand the child in the front of the line a ball, and have her pass the ball over her head to the person behind. The next person does the same until the ball has been passed to everyone. Next, have the children line up once more and ask them to bend forward and pass the ball in between their knees to the person behind them. It’ll take some practice, but these are both great hand eye coordination exercises! Bean bag toss. Grab some small bean bags and hula hoops and have your child practice throwing the bean bags to specific hula hoops. Another option is to hold the hula hoop vertically and have your child toss the bean bag through the hoop. Play a good ‘ole game of catch. For newbies, start with a soft object like a bean bag, and make sure to stand relatively close to one another to make things easier. As your child gets better at throwing and catching, inch farther away from each other. Walking on a balance beam. Of course, not many of us have balance beams lying around in our basements (LOL), but you can easily replicate the idea of walking on a balance beam by having your child walk on the curbs of the sidewalks in your neighborhood (with your supervision, obviously), and most playgrounds have balancing equipment your child can practice on. You can also buy a roll-up balance beam if needed. Bouncing a ball against a wall. As your child becomes more comfortable with rolling, passing, throwing, and catching a ball, have her throw a ball against a wall and then catch it as it returns to her. This is a great independent activity to help develop hand eye coordination in older kids! Pinata. Okay, so you don’t have to use an actual pinata for this activity, but it certainly makes it more enjoyable! Tie an object to a piece of rope, suspend it in the air, and then challenge your child to try and hit it using a bat. Lacing beads. You can create your own set using a piece of string and a package of pasta tubes, or you can be lazy (like me!) and buy a set of lacing beads that can be used over and over again. Puzzles. Puzzles offer a great way to help a child develop her hand eye coordination. Peg puzzles and chunky puzzles are a great place to start, and then you can move on to age-appropriate jigsaw puzzles. Painting and coloring. Toddlers LOVE to make messes, and finger painting is a great way to start developing your child’s hand eye coordination. There are all kinds of paints and crayons designed for every age and stage! Cutting with scissors. Teaching kids how to cut with scissors can be tricky, especially if they struggle with hand eye coordination. Start with playdoh and a pair of playdoh scissors, and then check out these scissor activities for kids. Fun with pipe cleaners. There are so many fun kids activities you can do using pipe cleaners. You can thread them through the holes of a colander, slide beads onto them, cut them in half and ask your child to drop them into the neck of a water bottle…the possibilities are endless. Nailing nails. Alright, so I wouldn’t use a real hammer and nails for this activity (HAHA! ), but Melissa and Doug’s Pounding Bench is a great hand eye coordination toy. Fishing. I’ve seen moms create their own fishing games for their kids by tying paper clips to the end of a piece of string, and then having their kids ‘fish’ magnetic letters out of a bowl, but if you’re not a DIY-er, Melissa and Doug’s Catch and Count Fishing Game is just as good! Whether your child is slightly delayed with her hand eye coordination, or has more significant challenges as a result of autism spectrum disorder or another developmental delay, this collection of fun exercises and activities that improve hand eye coordination will be a fabulous compliment to whatever other treatment plan you choose to pursue to help your child overcome her struggles. Remember to practice often, to keep things fun, and to never, ever give up! 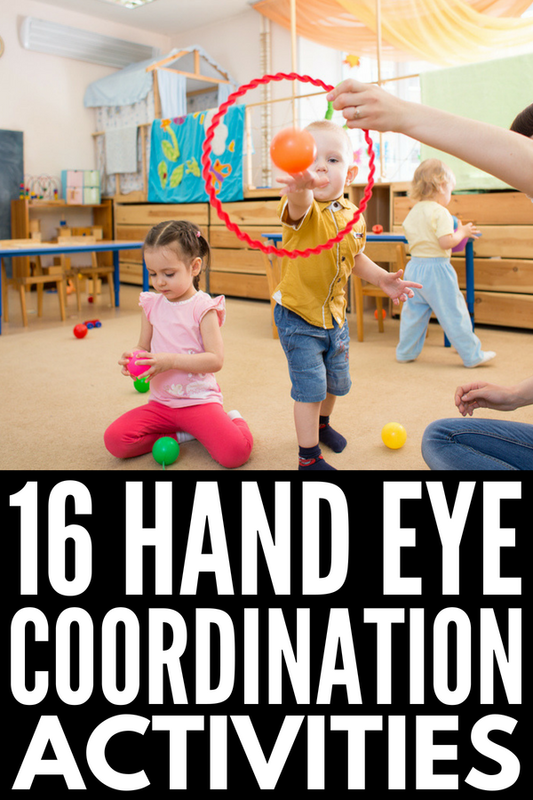 If you found this collection of fun exercises and activities that improve hand eye coordination helpful, please share this post on Pinterest! And if you’re looking for more ways to have fun at home, please follow our Kids board, where we share all kinds of fun ideas we find each day!